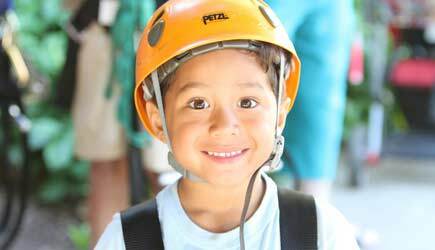 This page presents the zipline course that is the most family friendly and accepts children as young as five. If you are looking for a more extreme zipline experience, be sure to see our Flyin Hawaiian Zipline page. Look Ma ... no hands! 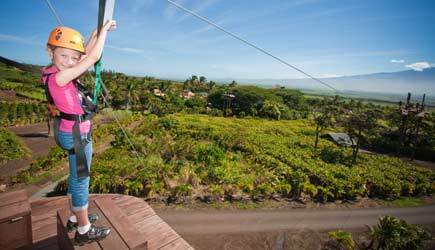 Zip past swaying palms and over groves of mango and papaya on Maui's newest and most family-friendly tropical zipline adventure. 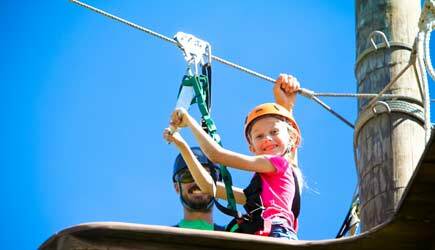 Maui Zipline at the Maui Tropical Plantation offers a fun and exciting tour that your whole family can enjoy together. With five side-by-side ziplines ranging from 300 to 900 feet in length, this course offers the perfect opportunity to experience this fast-paced and exciting activity. 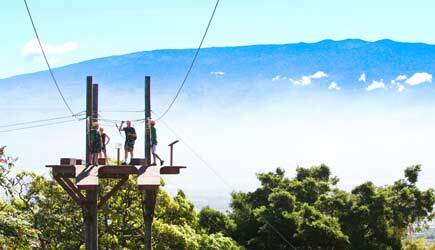 Your zipline adventure begins with check-in at the Maui Zipline booth at the Maui Tropical Plantation, which is centrally located on Highway 30 in Waikapu, which is halfway between Maalaea and Wailuku. After meeting your guide and getting set up with your gear, you have a short stroll on a well-maintained trail. At the top of the observation deck you'll be greeted with stunning bi-coastal ocean views and a beautiful view of the manicured gardens of the tropical plantation below you. 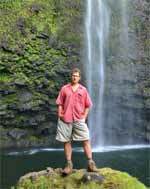 On each line you will soar over lush gardens as highly trained guides oversee your safety and narrate your adventure with information on Maui's agricultural plants and culture. 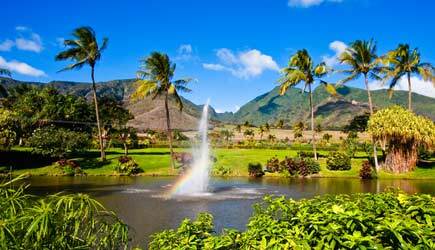 On the final line you'll pass through swaying palm trees and pass over the garden's large tropical lagoon!. 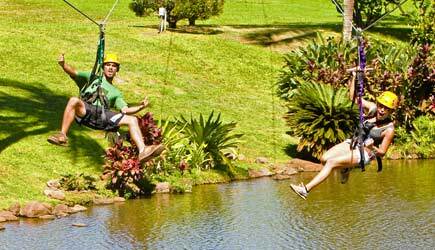 Maui Zipline is the best value around for this sort of adventure. 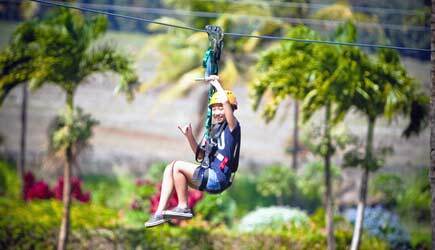 And it is the only zipline on Maui that can accommodate children as young as 5 and who weigh as little as 50 pounds. It is also one of the few courses where observers can watch much of the action from below at no charge. The exact length of time your tour takes to complete will vary depending on the size and confidence of those in your group, but allow two hours from check in to completion of your tour. Minimum age 5, minimum weight 50 pounds. Maximum weight 250 pounds. No neck or back injuries and no one pregnant. Depending on wind conditions, children who weigh less than 60 pounds may need to zip some lines in tandem with a guide. Chidren under age 11 must have a parent or guardian accompany them on the tour as a participant. Children 11 and older may participate with a parent or guardian signing a waiver and staying on the plantation grounds during the tour. All participants must sign a waiver of liability. 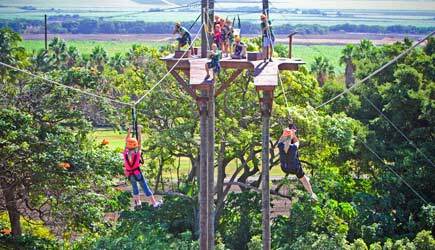 NCL cruise ship passengers in Kahului are able to this zipline tour either day in port. A cab ride of about 15 minutes each way is required. Lahaina cruise ship passengers can also do this zipline tour but a rental car is required and the drive time is about 30 minutes. Maui Zipline fills a nice niche as many families have been frustrate by the 12 year old minimum age on most zipline courses. Kids as young as 5 and who weigh as little as 50 pounds are able to do this course. This course was built not to be the longest, or the fastest or the highest, but the most accessible, fun zipline ... especially suited for those who have never done this sort of thing before. This course doesn't have the longest lines, the highest lines, or even the most lines. 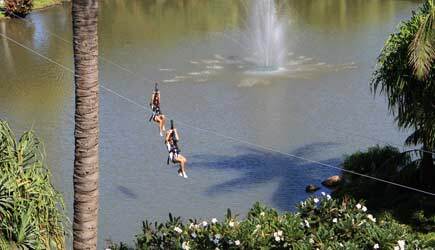 For those looking for a longer, more extreme zipline tour be sure to look at our Flyin Hawaiian Zipline page. But there are people out there who aren't looking for the most extreme tour out there ... and this course is a great introduction to zipping and may be just right for you. And at half the cost of other courses, the price is right. One other thought ... for those who are on a tight time schedule and trying to do a lot of fun things and not enough time on Maui to do them all. This zipline tour is located just about 3 minutes away from Maalaea Harbor, where the vast majority of Molokini snorkel tours begin. For a full day of fun, consider doing a Molokini snorkel tour in the morning, followed by this zipline tour at 2:30pm. Most Molokini tours return to the harbor by 1:00pm ... see our Molokini snorkel tours page for details.